Secure digital card files salvage software recovers formatted flash card data, damaged or inaccessible memory card documents, pictures, images, audio, video files. Micro memory card files restoration program recovers all deleted picture album from memory card of mobile phone. Card data restoration application supports recovery of all file formats such as m4p, 3gp, mp3, mp4, wav, avi, jpg, tiff, riff, png, gif, bmp etc. SD card recovery utility is read only, non destructive tool that provides interactive wizard style graphical user interface. Memory card data backup tool support all type of memory cards like compact flash, smart media, extreme digital card, micro, mini sD xD cards etc. Digital camera memory card photographs uneraser tool helps you to retrieve formatted video clips, deleted images from damaged multimedia memory cards. Memory Card data uneraser software is considered as the safe recovery utility for end users and can be easily handled by non-technical users to recover virus infected memory cards data. * Recovery utility is easy to use due to its graphical user interface for technical and non technical end users. 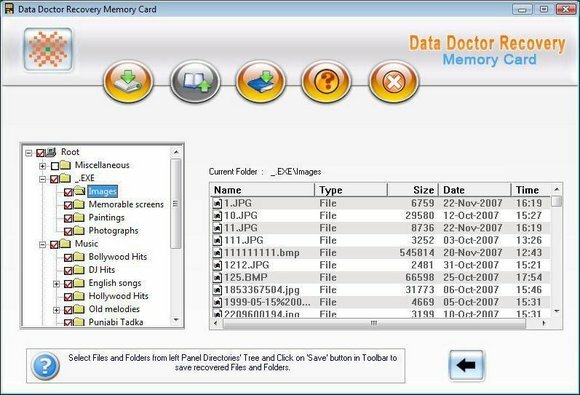 * Memory card data retrieval tool supports all digital files formats including jpeg, midi, gif, bmp, wav, 3gp etc. *Corrupted memory card recovery tool supports USB data storage media including Compact flash memory card, Smart Media, mobile memory card, SD card, PC card. * Software recovers data even common error messages ?DRIVE NOT FORMATTED? or ?DRIVE NOT DETECTED? is displayed while accessing memory card in My Computer on windows operating system. * MMC recovery software provides inbuilt help manual for end user. * Software provides both install and un-install support. * Data recovery utility supports all Windows operating systems including Windows Vista.